What does it really take to restore 20/20 vision? In a unique two-perspective piece, we get the inside story from an inspiring patient and her innovative physician on how they reached that goal. Rod Solar shares his thoughts on LASIK, explaining why refractive surgery is on the rise and how you can take advantage of it, in this month’s In My View. A team at the Icahn School of Medicine in Mount Sinai, New York, have reprogrammed murine Müller glia to drive photoreceptor genesis – restoring vision in mice with congenital blindness. How do patients experience pain of PRP treatment using conventional multispot laser and navigated laser, and how does this affect the duration and patient comfort of a PRP session? Dr. Francesca Amoroso and Dr. Alexandre Pedinielli talk about results of a recent study, practical PRP experiences, and the learning curve of getting used to a 2D screen-based treatment paradigm. 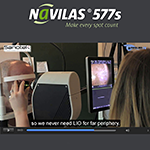 Improve your surgical success with our high standard iOCT! HAAG-STREIT SURGICAL presents the next generation of its intraoperative OCT system. Discover all innovative features at the ESCRS at our booth B311. In-house research and engineering, apace with innovative evolution of our products, meeting the emerging needs in ophthalmology. 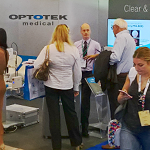 Come visit Optotek Medical at EURETINA / ESCRS 2018 in Vienna, booth C605. Get ready for the world premiere. Meet Sophi, the revolution in Phaco Surgery at the ESCRS 2018 in Vienna. Mobility, Simplicity and Safety, all combined in one device. Sophi looks forward to meeting you at Booth C106! Join our Lunchtime Symposium at ESCRS on Sunday 23rd September at 1:00 PM – 2:00 PM and meet Liberty, an optical concept for spectacle independence, quality vision and less visual defects. Multifocality in Comparison - Clinical Results and 3D Visualization of Trifocal and “EDOF” IOLs. Introducing the Ocular Surface Disease Forum, a live and online meeting with globally recognized experts that aims to highlight the importance of a healthy ocular surface in every ophthalmic procedure. Register below to attend the event live or online on October 5, 2018.